It’s almost time for Loy Krathong 2013. 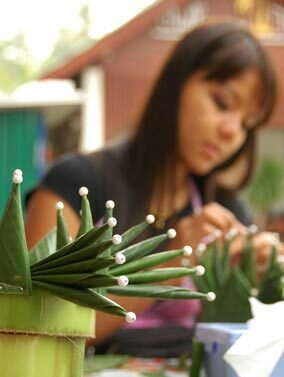 Making a Krathong from banana leaves. Loy Krathong will be on the full moon Sunday, November 17 this year. Loy Krathong is the annual festival where Thais send their bad luck from the previous year to the sea and start the new year fresh. In Hua Hin, there are several popular places to float your Krathong. The main Hua Hin beach, at the end of Damnoen Kasem Rd (Soi 61) is quite busy as is the beach at Queen’s Park at Soi 19. There are also several spots along the Canal Road for folks who don’t like the large crowds at the beach. There is a parade down Phetkasem Road with many decorated floats and beautiful girls vying for Miss Loy Krathong. Many schools, government organizations and local businesses participate in the parade. You will find many stands along Damnoen Kasem Rd and Petchkasem selling Krathongs for you to float. They are also sold in the Chatchai Market and in the afternoon of the festival around most schools. Many hotels also have special dinners and the Krathongs are floated in a pond or the pool followed by a fireworks display. As the Loy Krathong festival this year takes place during the mourning period for the recent death of the Supreme Patriarch, it may be a bit subdued this year but it should still be fun and an experience not to be missed. This entry was posted in beaches, children, festival by FBF. Bookmark the permalink. At what time does the parade start and where? Sorry about that. Normally the parade starts at Pone Kingpetch Park, just west of the City Hall, between the Post Office and the Railway Station. In recent years, the parade has gone down Petchkasem Rd, all the way past the Palace and ends at Queen’s Park at Soi 19, where there is the beauty contest, music, and folks float their Krathongs at the beach. I haven’t seen if that’s exactly what they plan this year but it’s a good bet they’ll do more or less the same as last year. The parade usually starts around sundown. If the weather is good, the park can get quite crowded. If you want to go there, I would suggest parking on the road near the Majestic Beach Resort Hotel where you can see the parade pass and then walk down to the park and enjoy the music and float your Krathong. If you want to float your Krathong somewhere else, then you can view the parade just about anywhere on Phetchkasem Rd. Alternatively, you could watch the parade near the clock tower and then walk down to the beach near the Sofitel and float your Krathong there. Both spots draw large crowds and are good for photographs.